Initially, intercalating dyes (SYBR green, Sito9 etc) were used to measure real-time PCR products. The primary disadvantage of this approach is that the detection includes both specific and non-specific PCR products. Intercalating dyes will bind to any DNA and will give a fluorescent signal that is the combination of specific and non-specific PCR product. If there is non-specific product present this will lead to an overestimation of the levels of gene expression for your target gene. DNA binding probe systems get around this issue by being a target specific method for realtime PCR detecting only the specific product. This is particularly useful if you have found non specific amplification occurs with your target gene by conventional agarose gel analysis. If you have found that your PCR is highly specific and no side product is amplified you may as well use intercalating dyes to perform realtime PCR as they are much cheaper. For intercalating dye relatime PCR you just need two primers, the intercalating dye and a cheap and efficient mastermix. We sell various intercalating dyes and mastermixes, please have a look at our shop webpage. you can order your primers through our Oligo Order Service. Both Taqman probes (Thermofisher) and UPL probes (Roche) are dual-labeled probes for realtime PCR gene expression analysis. 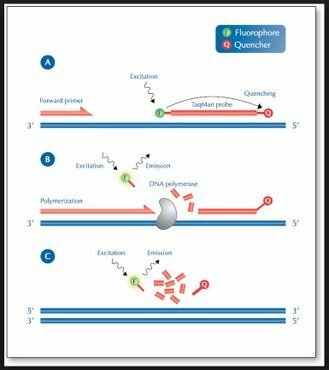 Both types utilize the 5´–3´ exonuclease activity of Taq polymerase to hydrolyze nucleotides of the target bound probe. with hydrolyzing nucleotides from the 5' end of the probe the reporter fluorochrome (R) is released which is usually attached to the first 5' nucleotide. In the inactive state (before 5´–3´ exonuclease activity) the Reporter is quenched by the Quencher (Q) at the 3' end of the probe by a mechanism called "FRET". 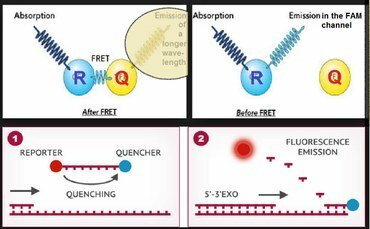 FRET stands for Fluorescence Resonance Energy Transfer and happens between the Reporter and Quencher as long as they are located in close proximity within one molecule. Once the Reporter is cut off the probe it is no longer quenched and will create a signal that is detected by the instrument. In most cases the Reporter (R) will be FAM labelled and only occasionally the Reporter is VIC labelled (house keeper or control genes or custom made probe sets). The old type Quenchers were TAMRA labelled. TAMRA has a small amount of emission of a longer wavelength. Modern Quenchers have almost no residual fluorescence and are therefore called "Blackhole" or "Zerowave", they convert the absorbed FRET energy into heat. During PCR, when the polymerase replicates a template onto which a probe is bound, the 5'- nuclease activity of the polymerase cleaves the probe. This decouples the fluorescent and quenching dyes and FRET no longer occurs. Thus, fluorescence increases in each cycle, proportional to the amount of probe cleavage. In the first ~20 cycles of the PCR there is Reporter produced and the fluorescence increases but this is not detected by the instrument because the amount of molecules produced remains under the detection limit of the detector of the instrument. 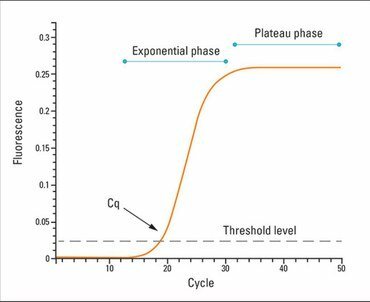 But as PCR is a logarithmic amplification there will be that cycle in which suddenly by doubling the amount of Reporter molecules the detection limit (called cT = cycle Treshold) will be reached and the flueorescence will be detected as can be seen in the graph below. UPL probes are competitive to Taqman assays and depending on throughput, gene and sample numbers, either Taqman or UPL probes may be more cost-effective. UPL probes are especially useful if you have many genes and not so many samples, whilst Taqman assays are the reverse. But in general you have two systems that are working equally well, so if you cannot find a Taqman probe or your assay is of low efficiency, you may wish to try the UPL probe for the same gene and vice versa. Both probes will cost ~45cents/reaction well in a 10ul scale. If you do not use all of the 500 reaction Taqman assay you might have a cost increase due to left over assay. Taqman and UPL probes work on both instruments (LightCycler 480 and ABI Prism 7900HT). Yet the default settings for both instruments make it easier to work with UPL probes on the LightCycler 480 and to amplify the Taqman assays on the 7900HTs. However, we can help you set up the instrument for UPL or Taqman assays if you have booked the "wrong" instrument or the other instrument is heavily booked. The big differences between Taqman and UPL probes is that Taqman assays take an average of 2 weeks to arrive when ordered (inventoried assays). Some assays might take 4 weeks (non-inventoried) and some up to 6 weeks (custom made assays), whereas UPL probes are always readily available because they are stocked as a library of 165 tubes in the facility. Hence, when using UPL probes you only have to order some primers from any supplier or via our Oligo Ordering Service and you are ready to go. Taqman assays will be supplied as a premix of probe and primers, so you don't have to worry about ordering primers. UPL probes work best with the Roche Mastermix (sold in the facility in 5ml aliquots) and Taqman assays work best with Gene Expression Mastermix from Thermofisher (sold in the facility in 5ml aliquots). For prices, please see our shop webpage. There are a lot of competitor mastermixes on the market and they may be better priced and work sufficiently well or even better. We only sell the recommended mastermixes from Roche or Thermofisher for probe based realtime PCR setup, for Sybrgreen or related non-probe based realtime PCR we supply other mastermixes than Roche and Thermofisher. Please talk to our facility staff or see our shop webpage. Where the Taqman probes and primers of an assay bind is not disclosed by Thermofisher. Instead the position of the target binding side and primer binding region is given with the assay design for the UPL probes. Taqman assays are also suitable for MicroRNA and siRNA, UPL probes do not offer this option. Both systems use an online assay design webpage to select probes or assays for your target gene(s). For more information please see below. For more information about Taqman assays including what the differences are in the assay names and quantities please see the Taqman webpage. For more information about UPL probes including assay design and assay setup please see the UPL webpage.